While investing in a new house or renovating a one, you might need a look of today. Metal roof for homes is in demand now and you should know, Why is so??. A metal roof being with the many advantages is much ahead of traditional asphalt roof in the market. People are spending comparatively more on their roof and are installing metal roofs. Are metal roof good for homes..
Metal roofs give houses a very distinct look from a variety of colors. Metal roofing prices may be higher than traditional asphalt roofing. But by taking a little higher price, metal roofing is offering you many years longer no maintenance cost. Installation prices might seemed too higher today but with this article, you opinion would might change. Metal roofs for homes cost can be easily covered with the no maintenance roof for many years. It is just like an investment in property which can also give you returns after many years of use. Installing metal roof saves you from taxes. And not just saving your taxes but also saves 40% of energy. Metal roofing gives you atmosphere appropriate in almost all seasons. It saves you from storm when high winds, saves you in heavy rains, protects you from ice. Beyond its many safety points, it guarantees your returns. No reinstalling or maintenance before many years. Metal roofing now comes with many options in looks too like textural look, plain classic colours, and divisional traditional look. 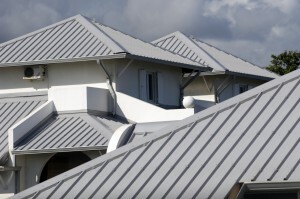 With the many metal roofing materials choices present from where you can choose from. Why a person won’t will install metal roofing. Also not just the looks, metal roofing offers minimum of 30 more years to your roof. For residential metal roofing, there are many more options available in market for giving a modern as well as classic look. Spanish style metal roofing is very much installed these days. It is one of the finest metal roof design that give a look, comparable with the price you have paid for installing it. With the 4 types of seam symmetrical seam, double lock seam, one and two piece snap lock interlock you can almost forget about your safety. With proper installations of metal roofs with these seams, you are always safe with wind, ice and rain. Double lock seams and symmetrical seams basically are more used by metal roofing contractors. As these seams provide high resistance from the bad weather conditions, and gives strength to roof. It is so preferred by many metal roofing companies. There are many metal roofing contractors and companies but choosing the right one is important as this is a question about your roof. The most important thing when we think about roof is its quality. With a trustable contractor, you are sure about the quality of the metal. As contractor knows all properties of metal, they can suggest you the best you should choose for your home. With the regions, metal roofing material choice too changes. Being in touch with a descent metal roofing company, you are safe as they are the one responsible for proper installation of the right metal at your roof. Your opinion of the high price of installing metal roof might now have changed till now. With the many pros of installing metal roof, you should also focus on cons. But cons associated with metal roofing being too less that too which can be covered with the pros. Like metal roofs is high investment, but by investing one time you can save energy for many years and also very less maintenance cost for years to come. So metal roofs have more pros than cons and one should go for metal roofing.